Get your friend an accessory that can truly reflect their personality and true vibe! 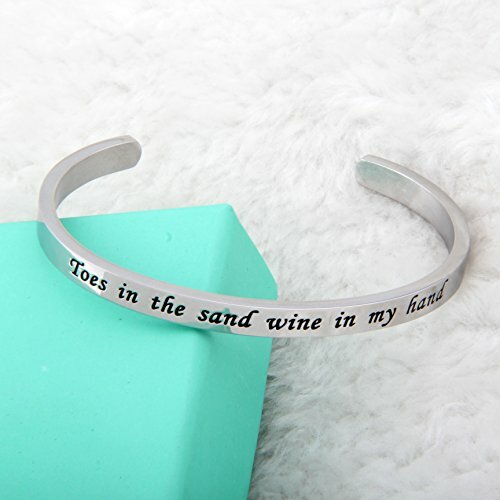 This cuff bangle is the perfect accent to a friend who does not just love good wine, but also love the feel of sand on her toes as well! 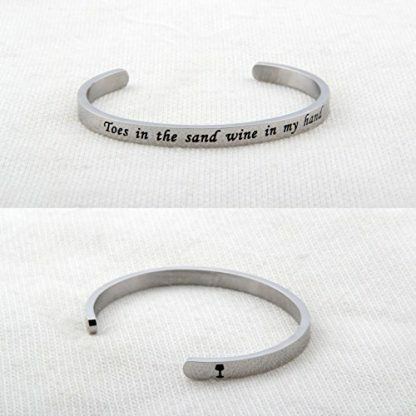 It is a charming bracelet for every wine and beach lover, and is made from 100% environmentally friendly materials. An accessory that can truly reflect the wearer’s personality and vibe is hard to come by. 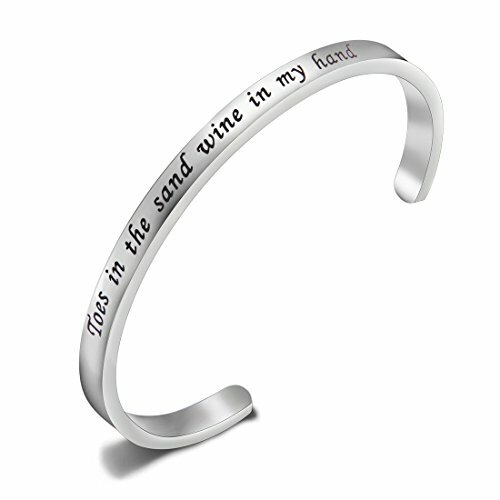 But for beach and wine lovers, this cuff bangle bracelet is the perfect item! It comes engraved with the words, “Toes in the sand, wine in my hand” which can truly mirror that chill and fun personality! 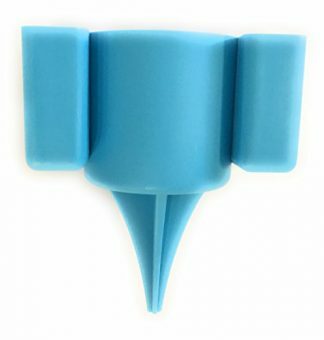 This is the perfect gift for friends who can never get enough of the beach and tropical vibe. 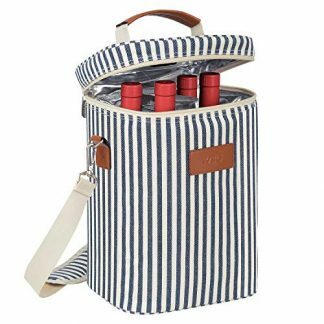 And also for the ones out there who love to chill at the shore and sip their wine slowly throughout the day. 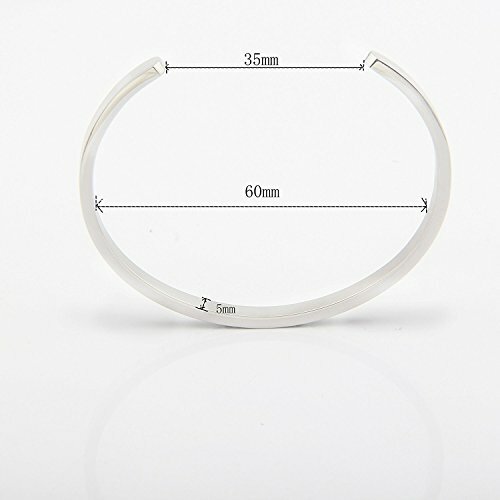 Made from environmentally friendly materials: Lead-Free and Nickle-Free recycled material plated with stainless steel. 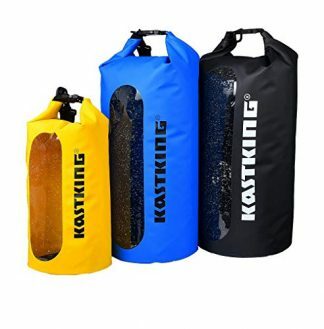 Comes with a velvet gift bag for easy gift packaging and giving. To ensure longevity, make sure to avoid contact from chemicals and wiping it with a soft cloth. Take it off when sleeping, showering, and doing strenuous activities. 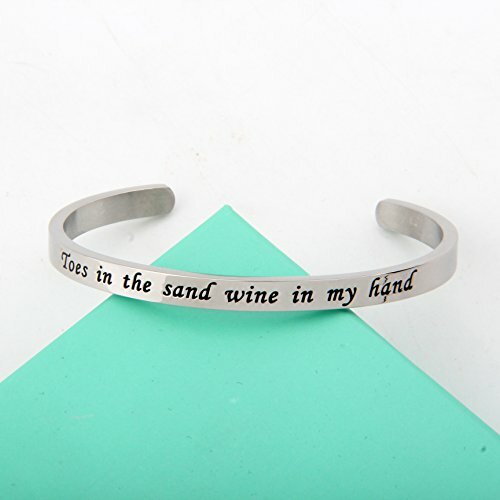 Surprise your wine-loving and beach lover friend with this unique and attractive accessory that really matches her personality! Get it for Christmas, New Years Day, or for special occasions such as birthday and anniversaries. 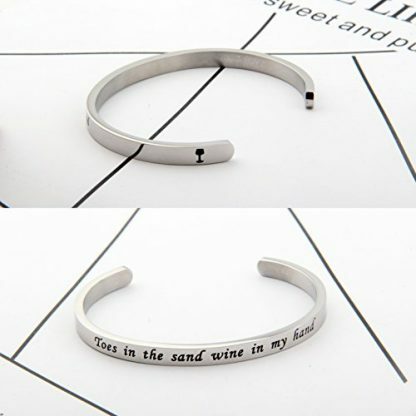 You can also give this to your mother, sister or cousin who loves the feel of sand on their toes, and the slow sip of wine at the shores! Give them a gift they can truly remember! With its elegant velvet gift bag packaging, this cuff bangle for beach lovers is suitable for any occasion. Whether it is a national holiday or in remembrance of a personal event such as graduations or friendship anniversaries, you can never go wrong with this! It may be elegant, but it is wearable enough for everyday use. Whether your friend goes to work or school, this can surely catch the attention of their friends and colleagues!